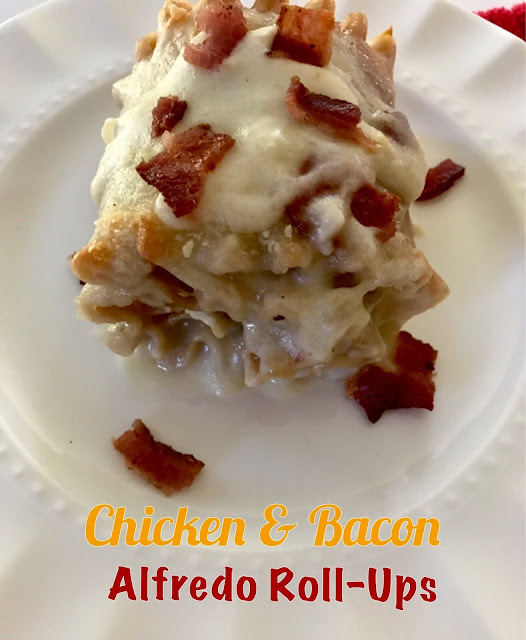 What do you get when you take chicken, yummy bacon, lots of cheese, Alfredo sauce and roll it up; you get heaven on a plate! My boys absolutely love these! A few weeks ago, I brought you my Baked Penne Pasta Alfredo and it got me thinking of more things to make with Alfredo sauce! While I've made Alfredo sauce homemade, we happen to love the packets of Knorr Alfredo. With just some butter and milk, it turns out nice and creamy. I like to make this lighter by using skim milk and I can't believe it's not butter. The great thing about this recipe is I was able to throw in some minced garlic and Parmesan cheese to the sauce, taking it to a whole new level! 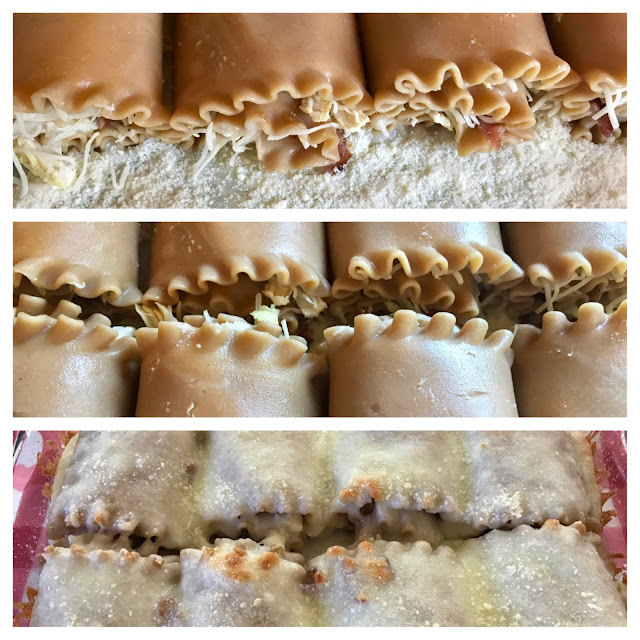 Using whole wheat lasagna noodles meant the noodles were a little bit heartier and so very easy to roll up. The key is laying the noodles out flat on some paper towels after you cook them and make sure they're cooled all the way. It only took about 10 minutes for them to cool off and like I said, the role up super clean and easy. I saved a few of the bacon crumbles to put on top. Again, this being a pasta dish, the leftovers were even more delicious! Preheat oven to 350°. Spray a 9x13 inch baking pan with cooking spray and set aside. Cook the lasagna noodles according to package directions until al dente. Drain and Rinse and lay them out on paper towels to dry. Next, cook the Alfredo sauce according to package directions. When thickened, stir in the garlic and Parmesan. Spread 2 Tbs of the Alfredo sauce over each noodle. Take ⅛th of the shredded chicken and bacon and spread evenly over each noodle and top with about 3 Tbs shredded cheese. Carefully roll up each lasagne noodle and place seam side down in your 9×13 prepared pan. Repeat. Once they are all in the pan, pour the remaining Alfredo sauce over the top and top with remaining cheese. Bake at 350 for about 30 minutes until heated through and cheese is bubbly. I've made these before & they were so so good!! Oh my goodness, this is mouthwatering! Thanks for the tip about the Knorr's sauce packet I am going to try that. You are so creative, I don't know how you do it but I'm sure glad you share it with us! Have a great Tuesday gorgeous friend! My Mouth is WATERING! looks amazing! 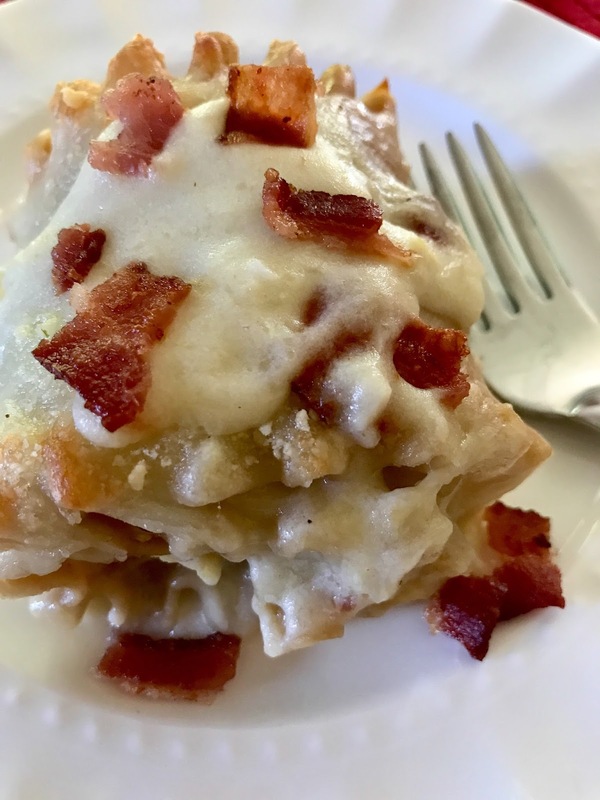 Bacon and lasagna, oh my word these look SO good. 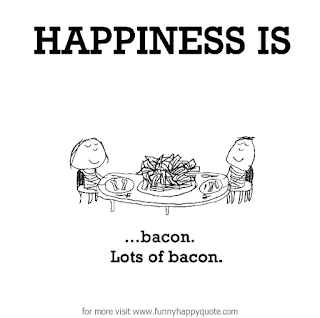 I made something similar once a long time ago but mine didn't have bacon. Clearly I messed that up. I need to try these out. Oops! I gotta little carried away and ended up commenting on Bloglovin and I wasn't sure you would see it! Anyhoo... this mama is TIRED! Running on three hours sleep due to TWO shots yesterday in the MD office!! Ugh! Anyway, you had me at bacon and alfredo and I've never tried the Knorrs brand of alfredo. Must try that ASAP!! These look heavenly! We will definitely love them and my boys will think they hit the jackpot! I am totally making these next week. They look delicious! My husband would be all over these! I'm not a huge fan of alfredo sauce, but he is always trying to get me to make it haha! Combine that with chicken and bacon and this would be his ideal meal lol! Thanks for sharing this, Andrea and Happy Tuesday! Oh my, these look incredible! Saving them for AFTEr my diet ends!! :) Have a terrific Tuesday! Oh my goodness stop it! These look amazing!!! Maybe for a Sunday splurge in our near future! That looks so unique & FANCY!!! Omg, this looks so good!! I just sent the link to my husband, as he is the cook around here. I'll let you know when we make it! yummy!!! Your recipe looks amazing and, just in time since I seem to have run out of some new recipes (simple new recipes). I'll definitely give this a try! Save on Pinterest as well. I am drooling. Can I come over for this? Please? Girl, these look SO good. Give me all the cheese and bacon! These look DIVINE!!!! No wonder the Nine boys are fans. I'm pretty sure mine would be too and Katie loves Alfredo, so I know she'd be on board. Happy Tuesday. Hope they kiss the cook! These look fantastic! So good, how you keep coming up with such fantastic recipes week after week, I will never know! Oh these look delicious! I have never done roll ups before, but I need to try them! My husband would love these, too! He's such a fan of anything with bacon! Thanks for sharing! Oh man this looks delicious. Definitely sharing. 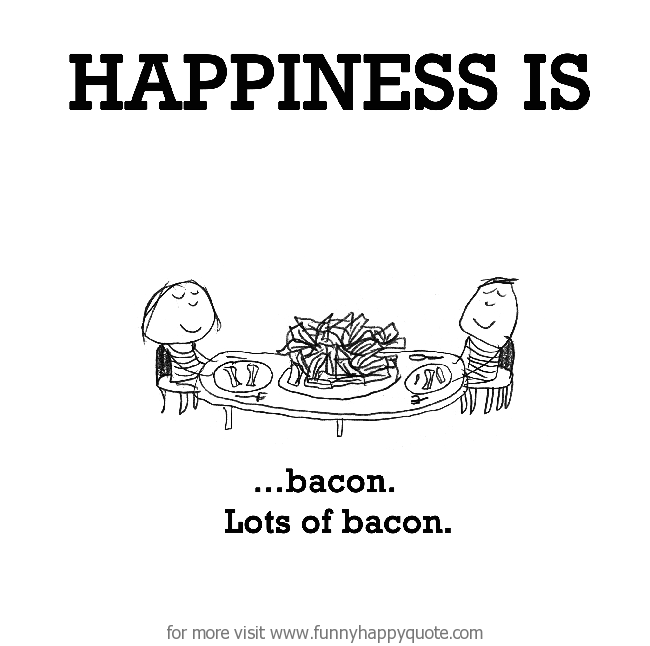 I feel like adding bacon to anything is just naturally going to make it so much better! 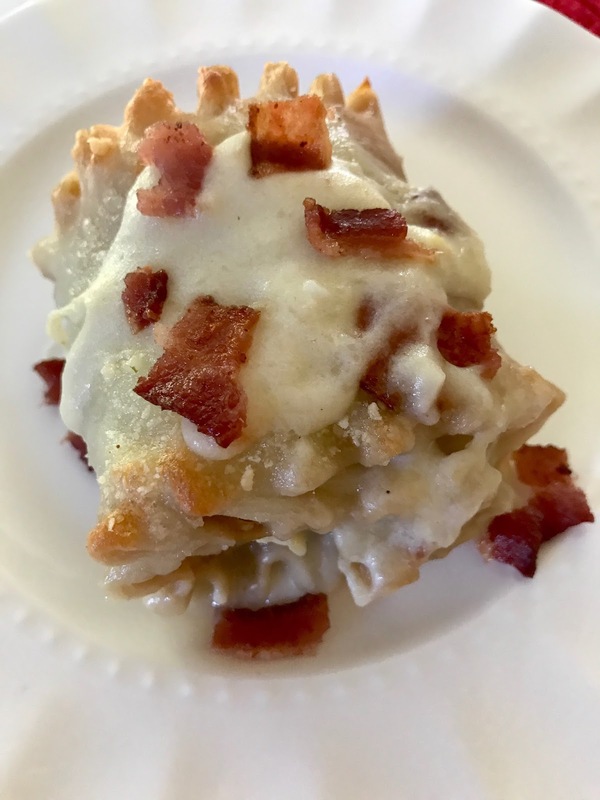 Chris and I love doing lasagna rollups, and this sounds like a delicious recipe to add to our list to try! This looks heavenly! I love all of those ingredients so how could it be wrong? Nope, can't! Holy Cow do these sound scrumptious! I am sure your guys loved them! I love that you doctored up the knorr sauce! You seriously always share the best recipes. 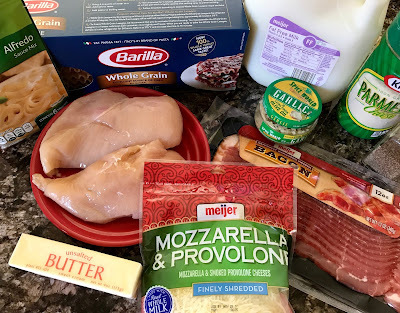 I am always looking for some different dinner ideas, since I cook dinner at home 5 days a week! YUM! 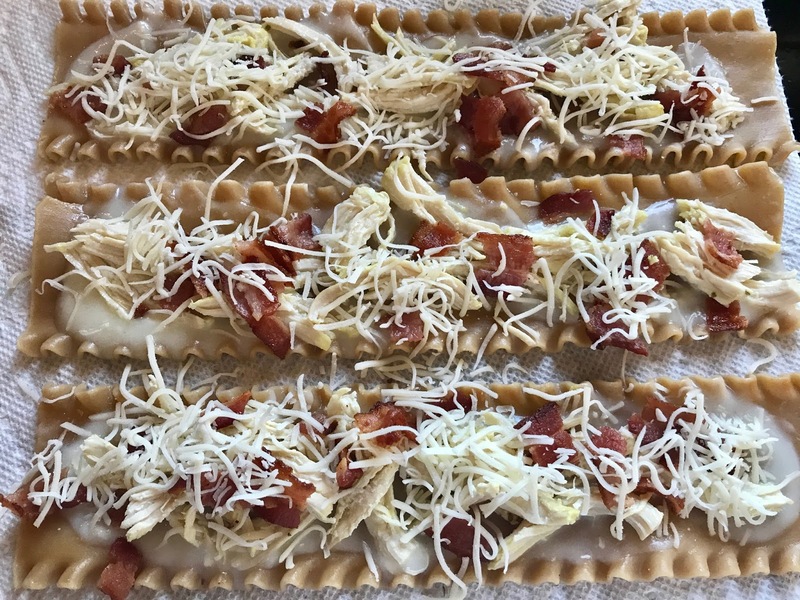 I have never made homemade alfredo, but should try those alfredo packets you mentioned in this post! Thank goodness you are not my neighbor! I would weigh 1000 pounds since I'd make you cook for me! Hope you'll add this to my Thursday post! This sounds amazing! My husband and daughter would definitely like this so I'm going to have to make soon! That looks so yummy! We use the Alfredo packets too (with skim milk) when I am feeling way to lazy to make it from scratch. Pinned. I know what's next on my dinner to-make list! This looks delicious!! This is a hearty and delicious meal and my idea of comfort food. this looks so incredibly good. We will just love your Roll Ups! Hope you have a fantastic weekend and thanks so much for sharing your awesome post with us here at Full Plate Thursday. We hope to see you again real soon. My family would flip over this!!! Yum!! All you had to say was bacon! Ha!!!!!!!! This is my kind of recipe! Looks so delicious. 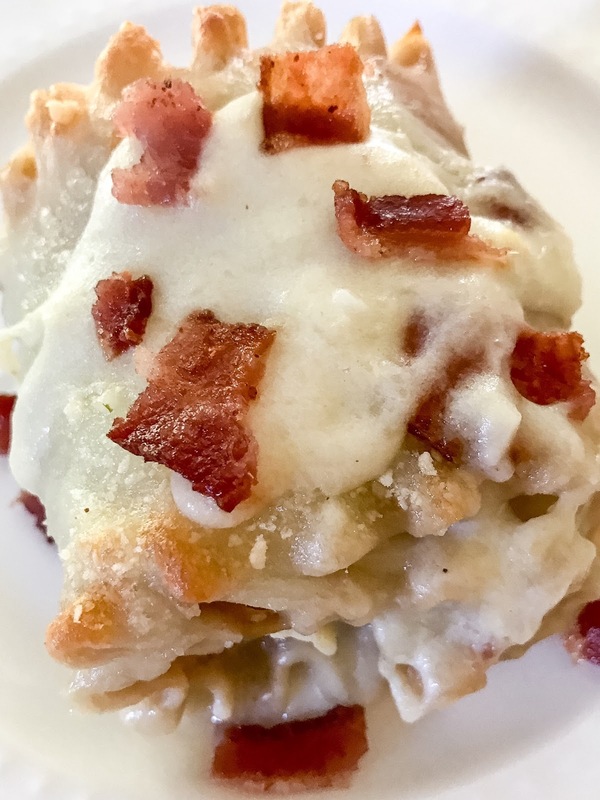 You can't go wrong with bacon and alfredo. That sounds so good, I can't wait to try this! 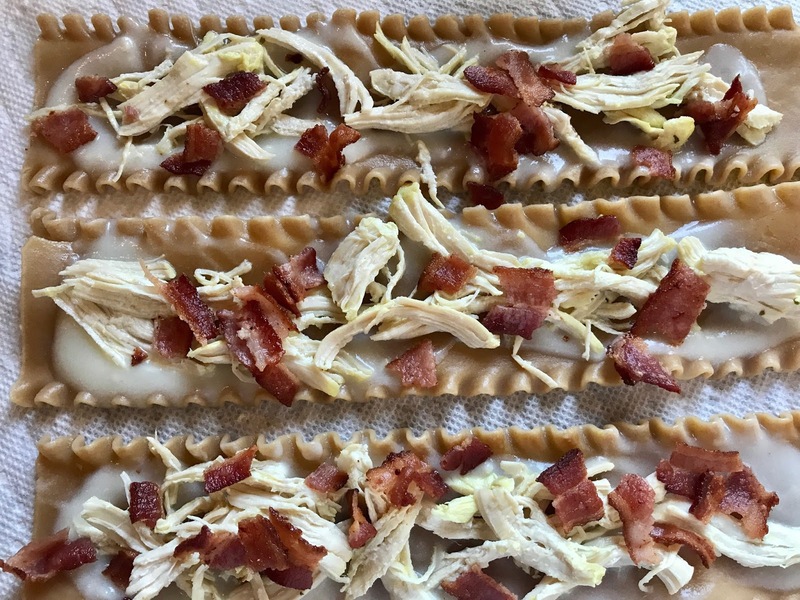 This yummy recipe is Featured at Merry Monday this week. Sharing on FB and Twitter. Ok, I think I'm addicted to your recipes. Teehee. :) Trying this one tonight! It's in the oven baking now. Thanks for sharing! GUILTY PLEASURES...HOW DO YOU TREAT YOURSELF?